Caroline McWilliams warms our hearts with how she first fell in love with Autumn; and our minds with top tips on how to accessorise this season. Layering is an essential this fall but it can still be done with style and the right colours can make magic in the Autumn light. For this month’s column I am straying slightly form my usual fashion orientated soliloquies into the realm of the autumnal aesthetic. On waking this morning, I realised that it has been nearly five years to the day since I was in rural Massachusetts exploring colleges while the autumnal leaves swirled around me. 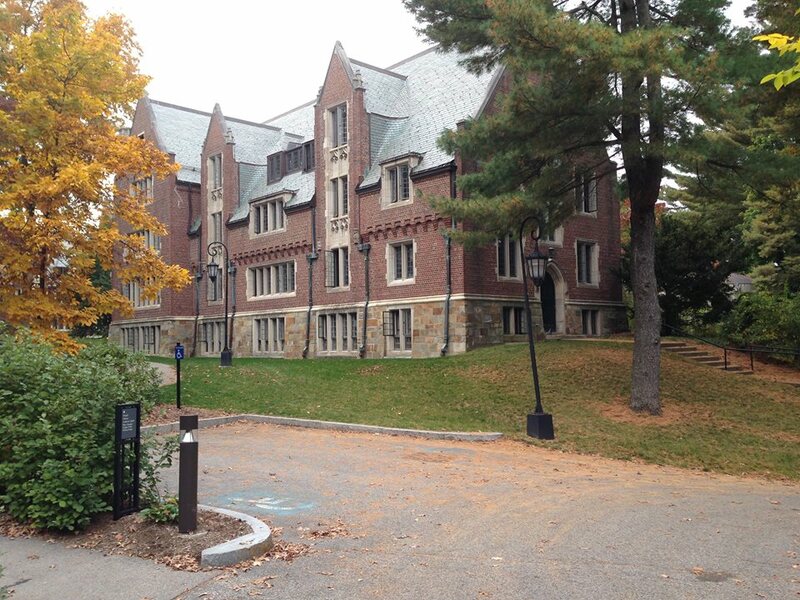 Mount Holyoke College with its neatly kept streets and manicured parks between buildings gave me a taste of the famous New England fall, but it was Wellesley that converted me to a love of all things autumn. On alighting from the train from Boston that Thursday morning, the air was crisp and golden, russet leaves fell onto the platform. I was early for my appointment at the College and so wandered into a coffee shop that was blatantly decorated for the season with giant leaves, branches and miniature sculptures covering the ceiling and surfaces. It should have been tacky but for some inexplicable reason was actually very tasteful. Continuing with the stereotypes, my Aunt and I partook of pumpkin cake and spiced coffee. The grounds of Wellesley College itself were even more beautiful than the little town from which it takes its name. Hundreds of trees surrounded the lake and hid most of the buildings from view. I spent the day twirling around in falling leaves and living in an autumnal paradise. I did not take up a place at Wellesley but my experience there in 2013 ignited my passion for autumn and has inspired me ever since. I am one of those people who struggle in the summer. It is not only because I have red hair and extremely pale skin; in fact, I do tolerably well in the heat. No, it is because I am simply terrible when it comes to a summer wardrobe. I either over-estimate or under-estimate the temperature, ending up carrying a jacket around all-day or shivering in the Scottish summer wind. I’m also a little boring and I’m not a great fan of summer flowery prints and I have a habit of tripping while wearing sandals and ending up with sprained ankles. So, when the summer nights fade away and the leaves begin to turn colour, I feel like a new world is awakening rather than slipping away. I am currently on a train through Scotland and although it is raining and very windy, I see promise in the scenery: promise of rebirth to come in the spring and promise of the regeneration of a beautiful countryside. And in the meantime, there is the promise of warm cups of tea, of mulled wine and of cosy evenings beside the fire reading good books. Oh, and holiday parties – those too. In my summer wardrobe can be found one or two very special pieces of clothing and my summer eveningwear is a source of great pleasure. However, I adore my autumn and winter wardrobe. My favourites include a burgundy woollen polo neck dress from Michael Kors that I am wearing today paired with flat black suede boots, a silver scarf fastened with a Mackintosh brooch and silver jewellery. My hair is curled against the wind and I have covered it with a black beret. This outfit gives me such confidence, which my summer outfits do not always accomplish. I own various wool dresses in different colours ranging from simple black to a burgundy tartan. Several can be layered with polo necks or blouses for extra warmth. In summer I am limited to my few silk scarves but now I can mix silk on cooler days with colourful wool ones, or even the best purchase I made last year: a black faux fur stole that is just like having a cat hugging me constantly. Additionally I adore wearing gloves. My flatmate laughed when she saw the roughly ten pairs of gloves I own. Most are leather and make my hands feel so protected. I have a range of colours from black to blue to pink. The pink ones are especially fun to pair with my pale blue A-line coat! Hats add to the fun too! It is a season where accessories are one’s best friend and layers are so important both for style and warmth. This autumn I intend to experiment with my colour palette; blending different colour combinations together and wrapping up as warm as I can before going home and sitting beside the fire with a warm cup of tea. This season will always take me back to that day at Wellesley and I envy the people who are able to experience that autumnal serenity every year. Scotland in autumn is pretty beautiful though so I can’t complain too much – only savour the season.